Owner Katey Headley at her bridal boutique, Ghost Orchid Bride, which has just opened in Hull’s Fruit Market district. A contemporary bridal boutique claiming the ultimate wedding dress shopping experience has opened in Hull’s Fruit Market. With an exclusive collection from some of the world’s most creative bridal wear designers, Ghost Orchid Bride brings an exciting blend of designer gowns, cool indie labels and unconventional chic to Humber Street. 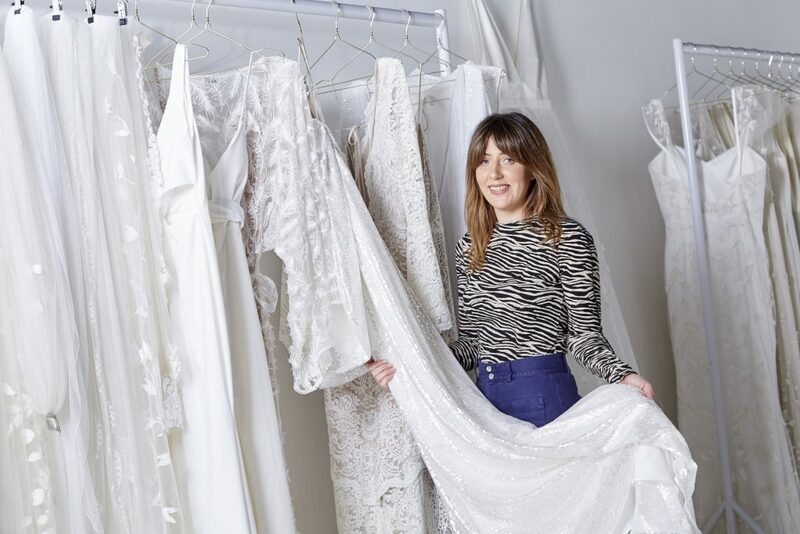 Working on an appointment-only basis, owner Katey Headley provides a private boutique environment for brides to choose a dream dress, away from the hustle and bustle of a crowded fitting room, yet in the heart of the Fruit Market’s independent shops, bars and restaurants. Katey said: “Choosing a wedding dress is a very exciting experience, so we work incredibly hard to give our brides a fun, memorable and stress-free day. “We operate a private appointment policy so brides can come along with friends and family, enjoy some music and a glass of Prosecco while they choose the perfect dress – it makes the day a really fun-filled and relaxing occasion. Already featuring dresses by top bridal designers such as Alexandra Grecco; Daughters of Simone; And For Love; and Chantel Lauren; Katey has recently added Australian bridal house Chosen by One Day and accessories brand A.B. Ellie to her range. Katey added: “We work with amazingly creative designers who push boundaries within the bridal industry. “Our brides are fashion conscious and want to wear something exclusive on their wedding day that will turn a few heads! Ghost Orchid Bride is the latest business to open in the Fruit Market, hot on the heels of new bar and brewery Taphouse Brewpub and soon to be followed by fashion boutique Tessies and urban gym The Temple. The reinvention of the Fruit Market as Hull’s first urban village, featuring independent, creative businesses, shops, galleries and restaurants, is being driven forward by Wykeland Beal, the regeneration company formed by commercial developer Wykeland Group and housebuilder Beal Homes, as part of The Fruit Market LLP joint venture with Hull City Council. Tom Watson, Development Surveyor for Wykeland, speaking on behalf of Wykeland Beal, said: “We’re delighted another local independent business has opened in the Fruit Market and one that is so original and distinctive. “The retail element of the Fruit Market is now really taking off and adding to the whole experience for visitors. For more information on Ghost Orchid Bride visit www.ghostorchidbride.co.uk or follow the brand on Instagram and Facebook @ghostorchidbride; Twitter @BrideOrchid; and on Pinterest at @GHBride. Be the first to comment on "Ghost Orchid Bride marries into the Fruit Market family"